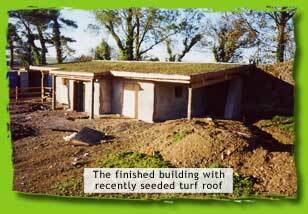 This July, we built a strawbale stable block at Ballinacurra House near Kinsale, Co. Cork. Ballinacurra is a beautiful old house being very tastefully renovated by Des and Lisa McGahan (see www.ballinacurra.com for more information), and they needed a stable block in a field near the house. This was the first strawbale building job I have yet undertaken where I got no Three Little Pigs jokes during the whole building process, as everyone was too busy cracking jokes about the horses eating the building! I was involved at the design stage working with the Ballinacurra building team, and then they did the foundations. When I got onsite I had 6 days to do all the wall raising and get it up to the stage of being ready for plastering (this limit was due to my availability, I had to be in Wicklow to teach a Permaculture Design Course…). I was ably assisted by a team of volunteers, who wanted to learn how to build with straw and who, in doing so, helped get the job done. We spent the first day making all the window and door frames, the second and third raising the walls, the fourth putting on the roof plate, and the last two days finishing off and cutting back the walls for the plastering. The weather behaved itself during the wettest July on record, only raining when it wasn’t too much of a problem for it to do so. The building is load bearing strawbale and is divided inside into two stable rooms and a central tackroom. It is now plastered and looks fantastic. The Ballinacurra guys did a great job on the roof and the plastering, and it really looks the part in its setting. It is ironic that the horses will have the best insulated house in the place!